(Newser) – Syria descending into civil war, the Arab Spring, instability in Egypt—the Middle East is full of uncertainties that threaten Israel, but all of them are "dwarfed" by Iran's nuclear threat, said Israeli Prime Minister Benjamin Netanyahu last night, reports Reuters. Netanyahu's comments were broadcast live by Israel's media, and published in both right- and left-wing newspapers, as debate grows in Israel over whether the country needs to go to war with Iran. 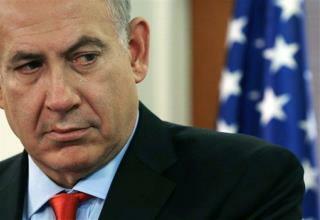 "I say again that Iran must not be permitted to obtain nuclear weapons," Netanyahu said. Let me ask. Does Netanyahu's rhetoric now sound anything like George W. Bush in early 2003 ... or even earlier? It sounds like Bibi is reading Gee. Dubya's playbook to me. Anyone? So let us see if I have this correct. Iran is building power stations, which it is allowed to do because they signed the Nuclear Non-Proliferation Treaty, and Iran is also manufacturing nuclear isotopes for medical use (which competes with and drives the prices down of similar products exported by Israel) because they signed the Nuclear Non-Proliferation Treaty. Iran is not building nuclear weapons and we know this because Iran allows full IAEA inspections, as a signatory to the Nuclear Non-Proliferation Treaty. So here comes Israel, which has nuclear weapons, was vcaught trying to sell one to South Africa, is NOT a signatory to the Nuclear Non-Proliferation Treaty and does not allow IAEA inspections, screaming that the world must force Iran to scrap all peaceful uses of nuclear technology they are legally entitled to. And Israel wonders why the world thinks it is Israel that is being unreasonable.So here comes Israel, which has nuclear weapons, was vcaught trying to sell one to South Africa, is NOT a signatory to the Nuclear Non-Proliferation Treaty and does not allow IAEA inspections, screaming that the world must force Iran to scrap all peaceful uses of nuclear technology they are legally entitled to. And Israel wonders why the world thinks it is Israel that is being unreasonable. But Israel's battle ready 200 atomic weapons are for peaceful security only. They would never strike Iran with them. All world citizens need to speak up and prevent a nuclear genocide against Iran.